I can pride myself with the fact that I mostly (mostly, yes) eat homemade food and that the said food is natural. Made with natural ingredients, sometimes mixed in with some chemistry, hard to avoid. 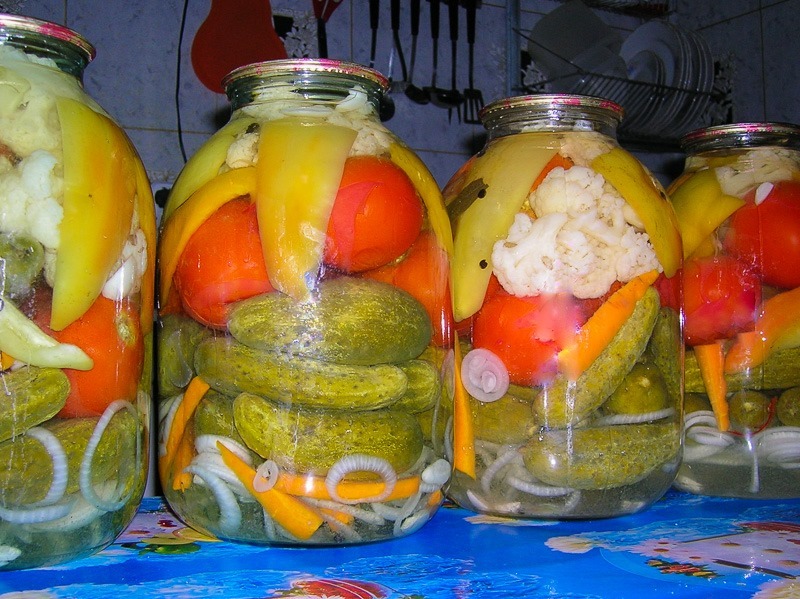 When I lived in Ukraine, the chemical food was more expensive than the natural stuff. Kitchen gardens provides the potatoes, tomatoes, cabbages and whatnot. Milk in some cases came directly from the cows, sometimes we needed to wait until it had settled down after milking. Some things were not recommended though, like dried mushrooms. Mushrooms have the habit of absorbing all kinds of bad things from the ground, like radioactivity. Of that, there was a good supply, so mushrooms were off the menu. 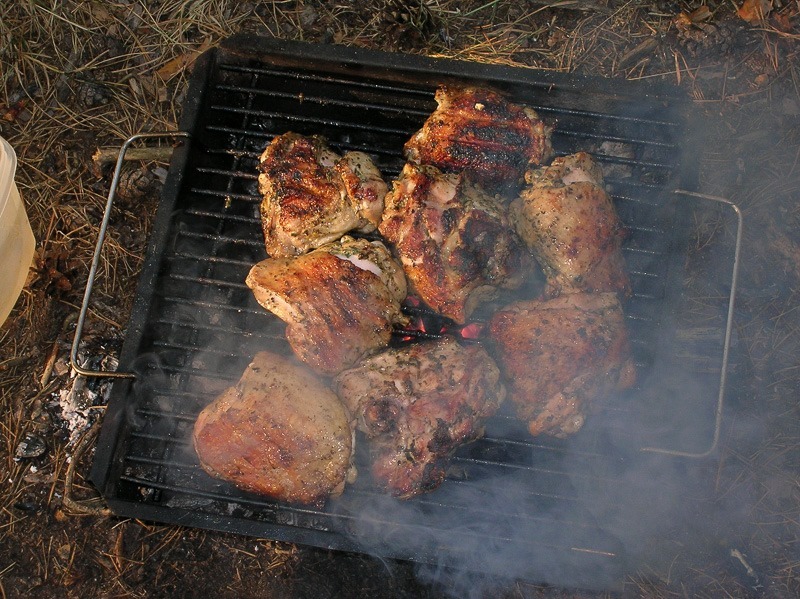 Chicken was a fairly cheap kind of meat and was often on the menu, on the table as well as on the barbecue in the woods. Pictured here is a fairly elaborate barbecue, most of the time the fireplace was made from bricks and simple firewood from the forest around us. The need to bring your own grids was thus normal. In case you didn’t have a grid, well, skewers were the next best thing. Sometimes even better than anything else as skewers do keep a fairly good piece of chicken on the fire . 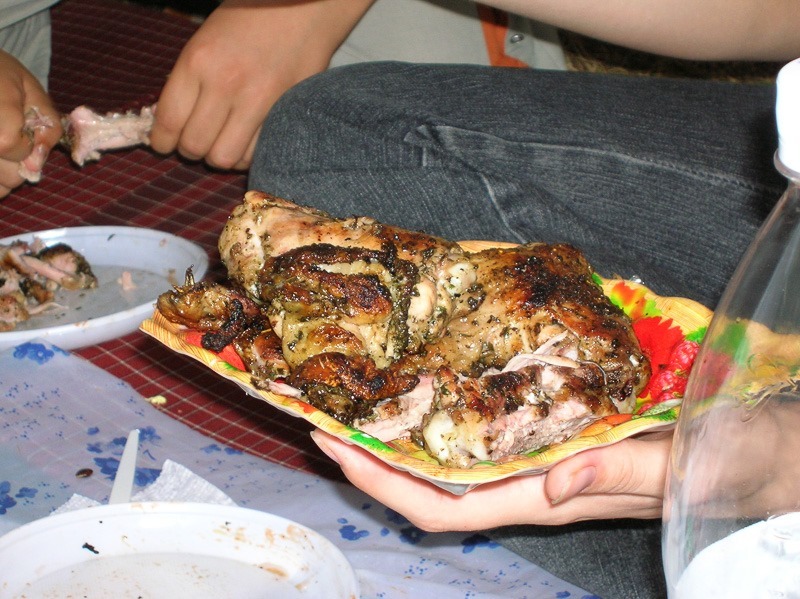 Chicken came from the “farm” or village. Hardly ever did we go and buy them in a supermarket. At least we knew where the chicken came from and was more or less guaranteed by the seller. I have only once had a bad chicken, and guess where that one came from? That’s right, a supermarket. But not all we ate was chicken. 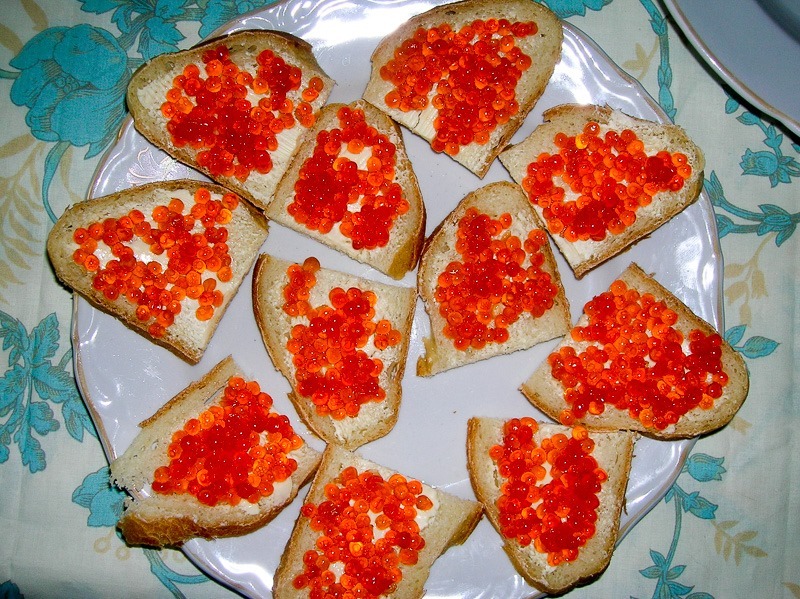 Being not far from Russia, caviar was a fairly “cheap” ingredient to come by. On special occasions we had this for breakfast, like on Easter or Christmas. Not all was chicken and not all was eaten outside on a wood fire. Special occasions were fairly “common” and a meal in the office was always a nice deal. Everyone brought something, which made for a pretty well stocked table. One thing that is missing from the picture above is the liquid variety of the food… Somehow they managed to get that on the table once I was done with my camera. On our own table though the good stuff was there even before I started getting the camera . A long paper tax label over the top of the cap was supposed to guarantee the quality of the product. Until the time came that colour printers were readily available. Christmas Eve with only the family was a special occasion. Also a special moment for some good, homemade food. 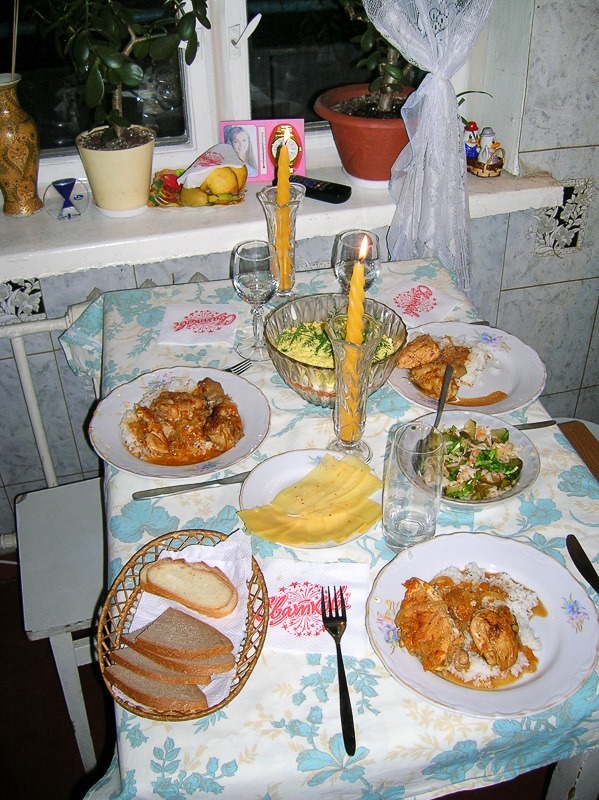 A simple dinner with excellent food, prepared with love and local ingredients. 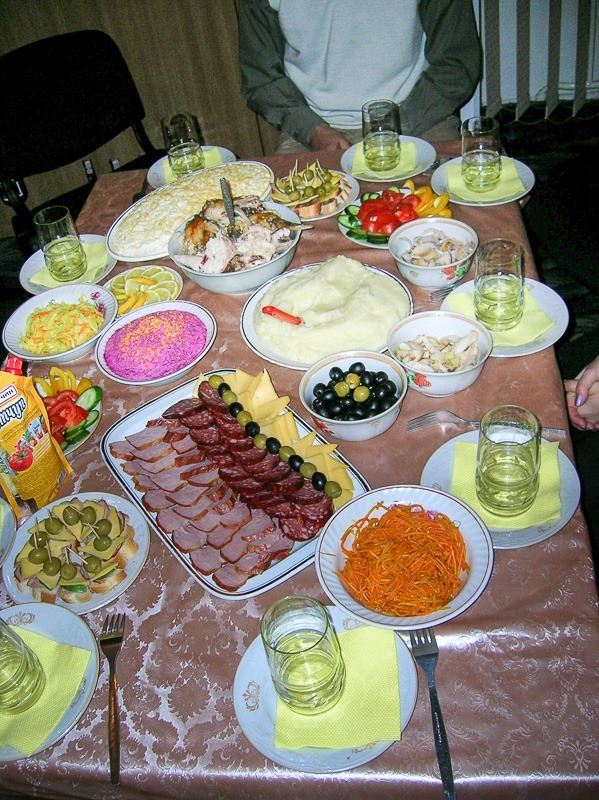 At first when I arrived in Ukraine, people wanted to “treat” me to the best, the imported stuff. Until I told them that local was way better quality. 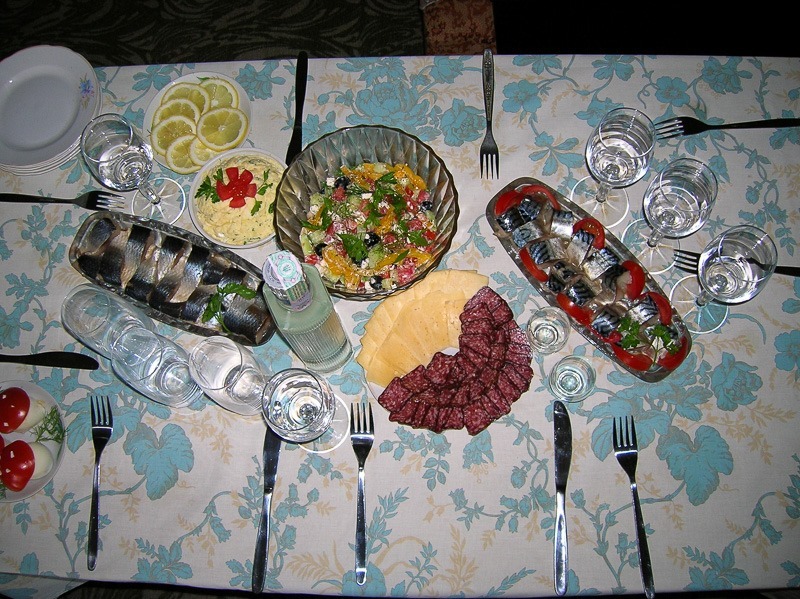 After that I have always eaten locally and healthy. The food we had was not only made to look good on the table, at times it looked just as appetizing in a pan as when it was all decked up and served. 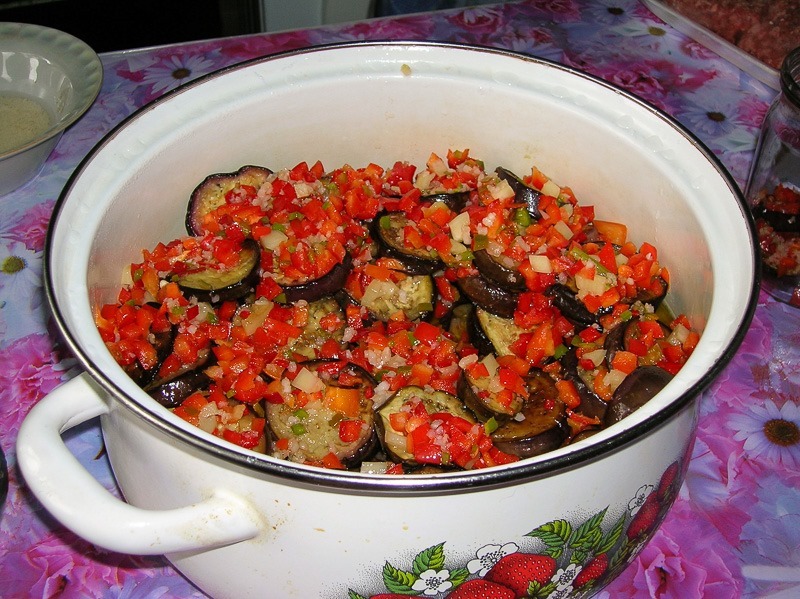 The above pan had eggplant and, among other things, hot peppers. It was aptly named “Ogonyok” or “Firestuff”. Obviously the pepper was hot, of an unknown variety here in Canada. I tried a bite on the market a few days before and my lips burned until the evening. A pretty potent pepper, I would say. 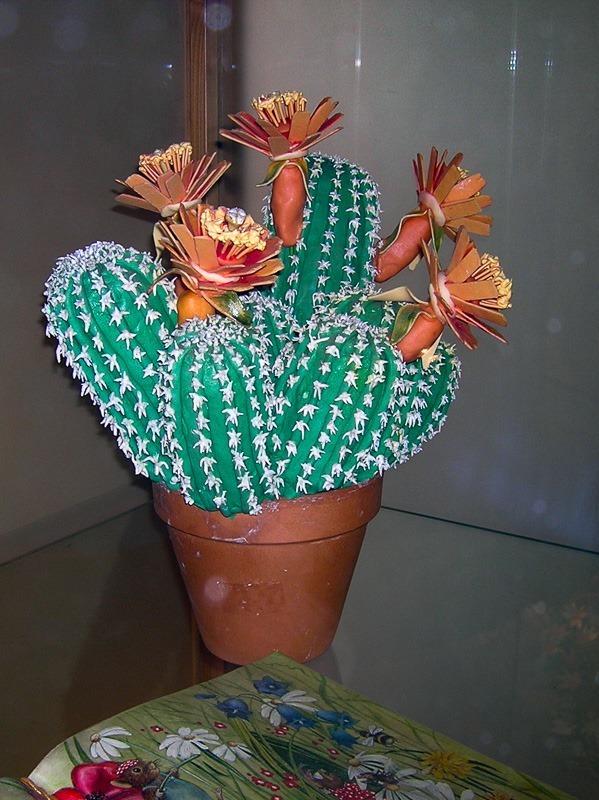 As for the cactus of the lead picture? I don’t know if you noticed, but that cactus is not a plant. It was made entirely from Marzipan. Photographed behind glass, this work of art was displayed somewhere in Hungary when we were there on holiday. Hungary? Hungry? After talking about food for this long I think I am going to get myself something to eat. Natural stuff, that goes without saying.